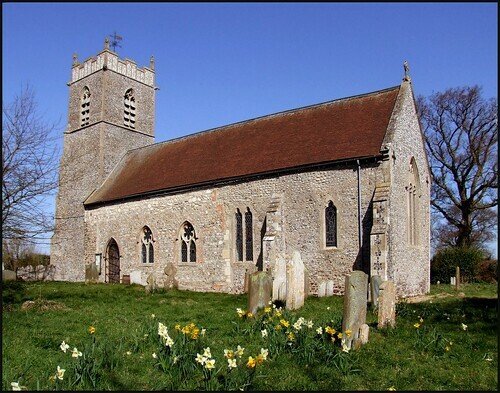 We headed west from the park of Barningham Hall to find another pretty church in the lost lanes of north Norfolk, its narrow graveyard fronting the village street, and its tower surmounted by elegant flushwork and pinnacles, a typical fancy of the end of the Middle Ages. It is a mark of just how big Norfolk is that this parish is not to be confused with Great Plumstead and Little Plumstead, both much larger and way off on the other side of Norwich. The village is often known as Plumstead St Michael. The church was once bigger, and if the south side looks a little odd it is because a low aisle has been demolished, and the clerestory filled in. Mortlock was rather harsh on the 19th century mock-Decorated tracery nave windows which replaced the arcade. Certainly, they look a little odd, but they have the kind of quirkiness which is the charm of the churches in this part of East Anglia. And, like hundreds of others around here, St Michael is open to pilgrims and strangers every day. It is perhaps the best part of England in which to explore churches. The interior is that of a typical late 19th century small church, made slightly urban in feel by the crispness of the pitch pine and Minton tiling. The nave has one of those elegant brass candelabras which are in several churches around here. You can see the remains of the arcade in the south wall, and this is the most significant survival of the medieval life of Plumstead. 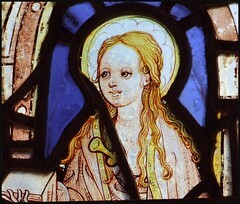 However, the church is rescued from anonymity by a good collection of medieval and continental glass brought here from Catton Hall, near Norwich, in 1950. The best of it is in the east window, a charming St Agnes set in the centre and then other panels depicting St Bartholomew, a monk and a Bishop. An intriguing feature of two of the panels is that two little heads fill a corner of the bottom of each. Almost certainly, they are portraits of the donors. Beside the heads, the barleycorn motifs which are typical of the Norwich School of the 15th Century are scattered across the floor beneath the Saints' feet. In a south window of the chancel are two large panels of 16th Century continental glass, including a floating angel, who really looks like nothing else I have ever seen in an English church. There are two unusual features in the nave. One is a set of Royal Arms for George VI, which I think may well be unique in East Anglia. I have seen several sets for Elizabeth II, but I do not recall seeing one for her father before. Along the wall from it is a sweet little memorial written in charmingly shambolic lettering for Theophilia Fleming, the daughter of Peter Wilson Esquire of this Town. She died in 1743 at the age of 42, although the memorial gives the date as 6th Janry 1742/3, as this was in the days when the New Year began on March 25th. The English calendar changed from this practice to the current one just ten years later. Her inscription records that in Piety and Virtue she was a bright Example. No one was evermore Deservedly, and Sincerely Lamented. What more could any of us wish to have said of us?